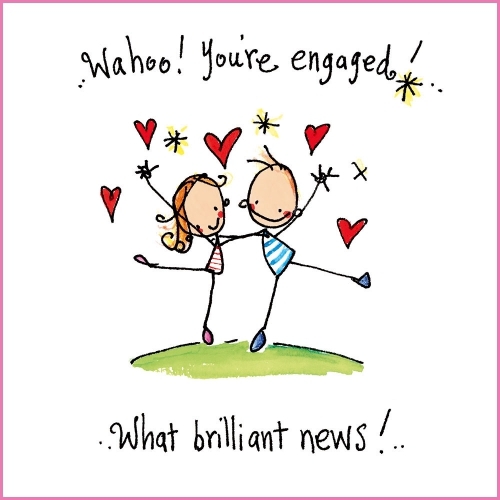 NwaVic: NwaVic's Wed2Plan Series: So You're Engaged? You're engaged.... And it only gets realer afterwards. In fact, the very word "engaged" means "to be busy or occupied." When you said "yes" to that ring, you didn't only say yes to the first test of a relationship (wedding planning), you said yes to many more challenges. But no worries, if done well, all the challenges will make your relationship stronger and not tear you apart. Having survived a lengthy and tedious wedding planning process despite my threatening type A personality, I'm at your service. Keeping true to the inspirational mandate of this space, I am here to help you get through the process...details and all. This post launches a series of posts about my journey through the wedding planning process and the lessons it has taught me about myself, my now-husband G, my family, friends, time, money and everything in between. It's all so overwhelming at first. So here's a map to help get you into the swing of things. I said it before but I'll say it again. The first thing to do after you get engaged is call the important people in your life. The personal calls (and maybe texts) have to go out before you allow anyone put it on social media. There's no worse feeling of exclusion than for your best friend to find out via Facebook. I can't promise you that everyone will be happy for you. In fact, if there's anything that will each you who genuinely wishes you well and who doesn't, this journey would. So don't base your happiness on reactions- base it on your gut feeling. If you're genuinely happy to spend the rest of your life with your fiancé, then don't let anyone ruin it for you. You're engaged: Be happy! "When is the date?" is the celebratory sentence that almost always follows the Congratulations. In fact, sometimes, it is asked before you have even considered it. I mean, moments after you said yes, before you've even had the time to get it fitted., in excitement people want to already start planning. It's almost as if they expect you to have known the date before you said yes. Sometimes, it catches you off-guard and then, you feel the pressure. Pressure, my sister, a concept you may have to get acquainted with through the wedding process. If asked before you've had that discussion with your fiancé, just respond with a smile, honestly but briefly, "____ & I are still working on that. We'll definitely let you know once it's set!" There are a million and one reasons why (even if you've set a date), being reserved about it at this early stage is vital...the most important reason being that, until you have "The discussion" with your fiancé, despite your long-time wedding dreams, you really don't know the real details (including the guest list) of your wedding. So, stick with the simple answer till further notice. Thank me later. 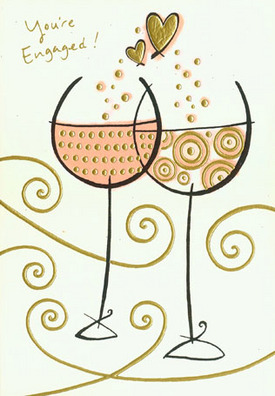 While I was dating my now husband G, my sister Ogo always said "Enjoy dating...make sure you savor each moment." Then, when I got engaged, she'd say "enjoy being engaged...enjoy the time before all the wedding planning." While I can pride myself on having taken her advice fully, I didn't fully understand why I did, till I was smack in the middle of wedding planning. So, after you get engaged, take the time to savor the moment..stare at your ring if you need to. Allow yourself a good time frame to appreciate what this step means to you and your fiancé. As part of his engagement plan, G planned a weekend getaway at a resort 3 hours away from where he proposed. It gave us an opportunity to enjoy each other's company and to just...be. We used that time together to celebrate us and where we were headed as a couple and it's something I'll always appreciate. 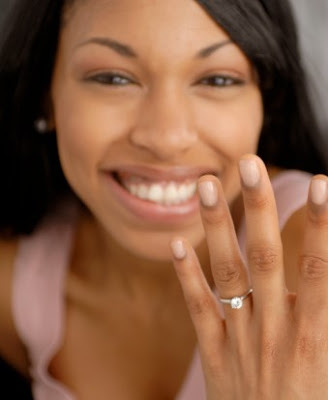 Some men already insure the ring when the buy it, but incase he didn't, make sure to insure your precious diamond. Like Nigerians would say, "just incase of incasity". Enough said. a. A Potential Wedding Date/Timetable: A typical engagement lasts 6 months to a year but don't allow that put you in a box. If you want a big wedding, just make sure you allow yourself enough time to plan it. Consider also if you want to have a traditional wedding (and where and when). If you're going to do one in a different country from the white wedding, I'd advise at least 4 months between both weddings. That is, of course, if you'd like to stay sane between both events. Lastly, for now, stick to a range of dates, because in reality, the wedding date cannot be set on stone till you find a reception hall, among other factors. b. Potential Wedding Location: Location, location, location. Where would you like to get married? What state or what country? Once you decide this, the picture starts to become clearer. If you're having a destination wedding, it'll then determine what type of wedding you can really have. c. Budget: How much are you looking to spend? And where will the money come from? This is the first lesson in uncommunicated expectations because you don't want to "assume" that your fiancé will be paying for everything while he expects that you'd be helping him. You also don't want to "thick" his parents will help when it's not the case. Communication is the key-make sure you're each crystal clear about who is bringing what and for what. Budget alone requires its own post and will be discussed in detail in a later post..wait for it. d. Theme, Style and Guest Count: Picture your perfect wedding: What do you envision? Is your perfect wedding on a beach, in a garden, in a mansion or under a tent in a field? Do you want a vintage, glam, romantic or classic wedding style? What are your colors? If you ever get stuck on choosing a theme, you can table this part of the discussion, for later. Then take time to look at websites, magazines and attend bridal expos for inspiration. This is the time to follow wedding pages on Instagram and Pinterest. The part of this discussion you shouldn't table for a while is the guest count. When you dream of your perfect wedding, do you see a big wedding or an intimate wedding? Do you envision a big party for everyone to come or do you want to be able to look into the room on your day and see only the faces of those you are 99% sure wish well for you and your fiancé or do you want something in between? The latter is the most important part of the discussion as you need to ensure you both are on the same page as your fiancé. Believe me, your guest count issue will determine almost everything else. Remember that many reception venues charge per head and as such, make sure if you decide on a number for the guest count, it's one you have to stick to. More on this later. e. Type of Ceremony: Do you want the wedding in a church or outdoors? One done by a man of God or just a state-licensed officiant? Do you or your fiancé have a favorite person who you'd want to officiate the wedding? While you're hashing these out with the fiancé, make an effort to remember the ultimate goal- to marry and spend the rest of your life with the love of your life. You'd have to do this often throughout wedding planning so start practicing beginning with the ultimate discussion. This is not the time to be selfish. While the wedding is seen as the bride's day, you cannot marry yourself- so it is indeed a special day for both of you. You'd have to make compromises and sacrifice. I remember first envisioning an outdoorsy wedding ceremony and bringing it up with G. The ceremony was one of the few things G was so determined about. He wanted a ceremony in a church officiated by his favorite pastor. More so, I was set about having a wedding in June and I couldn't have both because Texas is hot in June, unless of course, I wanted my guests to sweat bullets. In the end, he got his church wedding and I got my June wedding and it turned out very beautiful! Again, compromise! So there you go..the tip of the iceberg. Cheers to the journey I'm about to take you on. Sit back, relax and enjoy the ride! And stay tuned, more next week.